Ensuring that your floors remain clean and presentable is essential not only to impress your customers and staff but also for good health and safety practices. That is why we choose to undertake specialist training by the UK's leading stone floor care teams, TileMaster and NuLife, so you know that you can trust us to keep your floors safe and spotless. 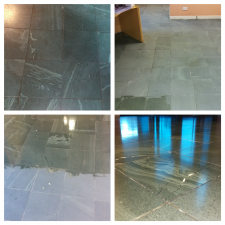 The pictures to the right are of a Burlington Slate entrance floor we stripped, cleaned and sealed at a high foot traffic distribution depot. You can see the dull, lifeless finish in the top left and then the stages of stripping the floor, sealing it and then making it shiny. This is a lovely job and the floor has now a real wow factor once again. If you would like to have a test patch completed on any of your floors, we will be more than happy to oblige. 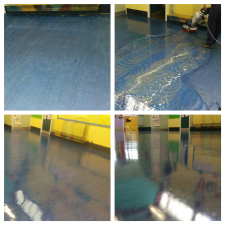 The marmoleum floor in this picture is from an after school club that suffered smoke damage. We had to strip, clean, seal and polish the floor to restore it back to a beautiful finish. Your workplace will benefit massively from having the floors properly taken care of by our floorcare team. Don't leave it to chance and get in touch to get your floors cleaned properly. Call us on 08000 463 422 for more information.